Richard Schaefer – Thank you, and welcome to all the media members for being on today’s call. They say everything is bigger in Texas and well, we had to bring a very big card to Dallas, and that’s exactly what we did. One week to go for the best card, top to bottom of the year taking place March 16 from the legendary AT&T Stadium, in the first PBC on FOX Sports Pay-Per-View. The card, when I say top to bottom, the best I can remember, combined records of the four televised fighters, 207 wins, 155 by knockout, I’ve never seen that, and only nine losses. I’ve never seen anything like that. I want to thank as well FOX for an unreal promotion by FOX. You watch FOX. You see commercial after commercial. It’s really refreshing to see how excited they are about the sport and how they put all their resources behind it. The different shoulder programs on FOX such as PBC Fight Camp and Inside PBC Boxing, are generating huge ratings. In fact, the ratings are so big that they exceed in fact most boxing telecast on other networks and platforms by far, and you’re just talking about background shoulder programming providing better ratings than actual fights on other networks. We anticipate therefore a huge pay-per-view audience and a huge live audience in Dallas, and I can’t wait. We have one week to go. But today we have David Benavidez and Errol Spence on the call. But before we’re going to turn over to them, I just want to spend a couple of minutes on the other two televised bouts. Chris Arreola versus the undefeated Jean Pierre Augustin is an amazing fight, amazing showdown as well. I saw Arreola this week at the media workout with Mikey Garcia. He’s in unbelievable shape. I’ve never seen Chris like that. He’s mentally, physically ready to go and he knows that he’s going to have a tough task ahead of him with Jean Pierre Augustin. Then Luis Nery versus McJoe Arroyo, believe me when I say that Luis Nery is the best bantamweight in the world and absolutely must see TV. He’s so exciting. I think there are tremendous fights for him, and this one here with McJoe Arroyo is his first one under the PBC banner. With Arreola, Nery, Benavidez and Mikey Garcia, we have four of the top five Hispanic fighters on this card, and all of them are in dangerous and meaningful fights. The man who is largely responsible to bring us these mouthwatering matchups week after week, is our co-promoter Tom Brown of TGB. And I want to thank Tom Brown for the excellent job he is doing. Now, let’s move on to David Benavidez versus J’Leon Love, clearly one of the best matchups and most exciting matchups that can be made in the Super Middleweight Division. It’s a pleasure for me now to introduce to you the CEO of Mayweather Promotions, Leonard Ellerbe, to say a few words about J’Leon Love. Thank you, Richard. J’Leon Love vs. David Benavidez is going to be a very, very exciting fight. In my eyes, it’s a terrific match up. It’s a match up that J’Leon has wanted. He’s had an eye on Benavidez for quite some time. I think that with J’Leon coming in as being the underdog, he’s going to lay it all on the line. He’s highly motivated and I think it’s a terrific opportunity for him to make a great statement fighting the very brave, talented David Benavidez. Everyone knows what Benavidez brings to the table. He’s a very, very exciting young fighter who had a tremendous amount of success at a young age, and he’ll be looking to establish himself by showcasing his skills out there to the world as he’s the best super middleweight out there. And again, this J’Leon vs. Benavidez fight is going to be a very, very exciting fight and I think the fans will love this fight. Excellent. Thank you very much, Leonard. I want to now introduce to you David Benavidez and I want to acknowledge as well his promoter, my good friend Sampson Lewkowicz. He has a tremendous eye for talent. We all know that. With David Benavidez, we have clearly pound-for-pound, one of the most exciting fighters in the world, and he’s here to reclaim the throne as the best super middleweight in the world. He’s determined to steal the night on March 16 in Dallas. And it’s a pleasure now for me to introduce to you the former WBC Super Middleweight World Champion, El Bandera Roja, David Benavidez. David? Hello Richard. Thank you for introducing me and I just want to thank you guys for this opportunity. I’ve been in training camp three months in preparation for this fight. This is also a fight I wanted for some time now. And it couldn’t be in a better venue than in AT&T Stadium. I’m just very blessed to have this opportunity, and I’m not going to let it go to waste. And I’m going to get a spectacular knockout come March 16. It’s really going to be amazing. David, do you still see yourself as the definitive WBC Super Middleweight Champion? I definitely see myself as the WBC champion. Nobody beat me. They’ve got to come get me, and they’ve got to come beat me to crown themselves champion. I definitely still see myself as WBC champion. If you win this fight against J’Leon Love, after this fight, is that the plan to go after Anthony Dirrell to win back the title that you’ve never technically lost? Yes, that’s definitely the plan, but for right now, my mind is 100% on J’Leon Love. He’s still a veteran. He’s still a dangerous fighter. So I can’t overlook him at all. First things first, I’ve got to take care of business next week on March 16, and then we’ll think about what’s going to happen after. Leonard, J’Leon Love’s last fight against Peter Quillin was judged by unanimous decision. And from what has J’Leon Love taken from that loss that he feels could help him in this fight against David Benavidez? Yes. Not to make any excuses, he had a lot going on in his life, a lot on his mind. And a lot of times what happens is, when a fighter is not focused, they come into a fight and they’re not fully prepared. But again not taking anything from Peter Quillin, outstanding fighter, but that was then. Thankfully he got this opportunity to fight a great young fighter, David Benavidez. And J’Leon is focused. He’s an expecting father. He’s highly motivated. He’s laying it on the line. He had a terrific camp and I’m just very excited to see him get this opportunity to go on there, and we know it’s going to be a tough fight because we know what Benavidez brings to the table. But I’m very confident that J’Leon will win this fight. David is this a fight about regaining confidence as a fighter after such a long layoff? Or is this a fight to make a big statement on a big platform on this pay-per-view? Obviously the confidence never went away on my part. I feel like this is a big stage and a big venue, so it’s making a statement. I feel like if I get a spectacular knockout on pay-per-view, my stock is going to go all the way up. Obviously I haven’t been in the ring for a while. It’s just going in there, seeing where I’m at the first few rounds. Then going back right where I left off as being comfortable in the ring, getting a few rounds in, and then obviously going to the knockout. How would you rank yourself at 168? Obviously I see myself as the best super middleweight in the division, but I have to prove myself. I do see myself at least in the top five. And I think when I get the opportunity to prove myself, I’ll show only to myself and to the world that I am the best, once the opportunities come up. If given the opportunity, how many times would you like to fight this year? If I had the opportunity to fight three times this year, that would be perfect for me. I feel like that’s the route I want to take. If I get two or three fights, that would be perfect. How do you prepare to fight in a venue like AT&T stadium? Are there any difficulties that come with being in that kind of environment? There’s no real way to prepare yourself to fight in a venue that big. You just kind of have to go by how it feels. The last time I fought at the Mandalay Bay, there was a lot of people there, but once the fighting gets to going, you really don’t really feel the crowd or see the people. You kind of just focus on what’s in front of you. Being around Errol, in the buildup to this fight, what’s your impression of him been throughout the whole process? He’s a very nice guy. He handles himself in a really professional way and every time I see him, I shake his hand. He’s a really nice guy. I really look up to him in that sense. He’s a great champion and I want the best for him. How excited are you about this opportunity to fight in Dallas in front of the fans and just the magnitude of this event and where you think this will catapult you in terms of getting into the bigger fights? I feel very confident I’m going to put on a great performance. I just want to thank everybody for keeping me in mind and putting me on this card on pay-per-view. It’s basically like a dream come true. So I’m confident that I’m going to get a spectacular victory. If I do that, there’s going to be so many people watching that. Once I get a spectacular victory, I’m in line for something big. If things go the way I think they’re going to go, people are going to want to see me, no matter what. And I think that’s going to set me in line for the big fights coming up. I just want to go back to where I was, having my belt back, fighting the best of the best. And I feel like PBC and my promoter Sampson Lewkowicz, they’ll take care of all that. I’ve just got to do my job and look spectacular and everything will take care of itself. Any thoughts on maybe going up to 175 soon? How are you feeling about getting yourself at 168? I’m very comfortable at 168 right now, but 175 is definitely an option. If there’s an opportunity to fight for a title or an opportunity for a big fight, we’re definitely going to go up. But as of right now, my thought is to stay at 168 and capture all the titles. I want to go back again to when you got stripped of the title and what was that moment like? What was that experience like of having getting something you worked so hard for, get taken away from you? It wasn’t a good feeling to have everything you worked for taken away from you in an instant. But it happened and it just made me hungrier and more motivated to keep working harder and to get back what’s rightfully mine. Being on the sidelines, seeing my belt won by another person I know I could destroy, kind of did it for me. We’re not going to take any more steps back. We’re working hard and we’re going to reclaim what’s ours and we’re going to put on spectacular performances and that’s how it’s going to be. What is the biggest thing you’ve learned about yourself in these last 13 months? Just the hunger. Just being hungrier, being more dedicated now, being closer to my family. And I just owe it to the people who’ve been supporting me since the beginning. I just want to be a better person and a better fighter for them, so they could have that fighter that they could be proud of. Do you feel this fight coming up is a redemption fight? Yes, definitely. This is a fight for the fans, just so they could see that, I don’t want nobody to lose faith in me because I know I’m the best I’ve ever been right now. I just turned 22 years old. I feel stronger than ever and I feel this training camp has been amazing. So this fight is definitely going to be for them, so they don’t lose faith in me. Who do you think wins that main event and why? It’s going to be a great fight. Both fighters are world class fighters. Errol Spence is a monster. He has a lot of power. Mikey Garcia is more of a technician. He has a lot of tricks underneath his sleeves. And I think this is going to be the fight that defines them. So we really don’t know what Mikey Garcia is going to bring to the table. I’m pretty sure he’s working on so much stuff. Errol Spence is too. I just expect it to be a great fight. I know both guys. They’re really cool guys, but I just feel like the people are really going to be the ones that are really going to win with a great fight. It’s going to be a great venue, the crowd is going to be electric and I just can’t wait for the fight. Were you surprised that the reaction to you owning up to the drug test and that it was met with such a favorable reaction? I definitely owned up to it because it’s something that a world champion shouldn’t be doing. It was just something I shouldn’t have been doing. Now I’m smarter. My father, me and my team, we’re just not going to be around stuff like that. We’re just going to stay dedicated to our sport. I know you’re looking at J’Leon Love, but with a win next Saturday, it’s like any fight that you want is right within your reach without having to worry about boxing politics. Does that kind of put your mind at ease going into each fight? Yes. It actually makes you more motivated too because this fight’s going to be made in an instant after my fight. So I’m very excited and very motivated for the fights and opportunities that are sitting on the table for me. Both Caleb Plant and Anthony Dirrell are great fighters. They’re world title holders. So it’s going to be amazing just seeing what’s next for the future for me. From Mayweather Promotions standpoint, what do you think of David as a fighter, and what it is about him that you see something beatable that you keep sending new guys after him? I’m not sending guys after him. David Benavidez is one of the most exciting dynamic fighters in the entire sport, not just in the super middleweight division. He’s a guy that I have a tremendous amount of respect for. I’ve had a very upfront and close look at him for a couple of fights. I’ve actually followed his career up until and before he fought Ronald Gavril. He’s a terrific fighter, but just like any fighter, fighters make mistakes and they have flaws. And J’Leon saw some things in the fight that he’ll be able to take advantage of. He’s a young veteran and he’s excited and motivated for this fight and it’s going to be a terrific fight. And I’ve got respect for Benavidez, but J’Leon is coming to win the fight and he’s confident that he’s going to get it done. Davis, with the stuff that has happened, is it almost as if you look at that and really wish it hadn’t happened and you could just go back in time and do it all over again? Or actually no, do you feel like you learned from it and it’s kind of a situation where you have that which does not kill us makes us stronger? It’s a little bit of both. Obviously those things that happened to me, I wish they wouldn’t happen, but in reality, it did happen. So I learned a lot about myself, me and my team. It just made us stronger. I’m not happy, but the way things played out, it just made us stronger. We’ve got good opportunities on the table and we’re just willing to take advantage of what we have in front of us. March 16 is going to be one of the biggest fights I’ve ever been in, probably that I’ll ever be in. I’m just truly blessed to be here. We’re taking the negatives and turning them into a positive. I’m just extremely ready for my fight next week. Who are some of the guys that you’re looking at and kind of licking your chops and saying, I definitely want that fight? Right now we’re going to take care of J’Leon Love, but obviously I do have some fights in mind. First I want to get Anthony Dirrell. And then if everything looks good, maybe I can unify with Caleb Plant in the near future. Each one of those guys has the belt. So that’s what I’m going to be interested in right now. Did you pay close attention to social media and what fans and other fighters had to say about your situation? And if so, what were your thoughts as far as what you read? I really don’t pay attention to social media too much because at the end of the day, I feel like that’s not real life. When I wake up, I train, I get my running in. That’s what really matters in the day. I’m not going to sit here and kill myself about what people say on the internet. Because in reality, that really doesn’t matter. Of course a lot of people have a lot of things to say and they’re entitled to their own opinion. I can’t control what somebody says. I’m not going to get angry about it either. Could you tell us a little bit more about what your training has been like and perhaps who you’ve been sparring with over the past few months? Yes. My training has been really good. I’ve been getting a lot of good strength and conditioning training. I’ve been getting a lot of running. When I was in California, I was sparring Dmitry Bivol. I sparred him for about a month, and I sparred a lot of other good fighters in California. And then I’ve been in Texas right now for about three weeks and getting some good work with some guys out here. So I could say, this training camp has really been one of the best training camps I’ve been a part of. I’ve been eager to get back in the gym and I’ve just been eager to show the people what I have, what I’ve been working on. I’m looking to get a spectacular victory on March 16. Thank you very much, David. Thank you very much, Leonard. I’d like to ask Leonard and David maybe to make a few closing statements, and then we are going to move on to Errol Spence and Mikey Garcia. Thank you, Richard. I want to thank everyone for joining the call today. There’s going to be fireworks come next week and I’m very excited. It’s going to be a great fight. I also want to thank everybody for giving me the opportunity, just to have me on this conference call as well. I want to also thank the guys the main event. It’s going to be a great fight. It’s going to be a great night of boxing. There’s definitely going to be fireworks come March 16. Thank you so much. Thank you guys. Now we are ready to move on to Errol Spence Jr. Saturday March 16. I call it the coronation in Dallas. Boxing fans, sports fans, and thanks to FOX, the general public will witness who will be crowned as boxing’s new pound-for-pound best fighter in the world. As we all know, there are two sayings in boxing. The first one is, a great big man always beats a great smaller man. If that holds true, Errol Spence Jr. will be crowned in Dallas. But there is another saying, made famous by none other than Floyd Mayweather, that skills pay the bills. And if that holds true, Mikey Garcia will be crowned. When the fight was announced, I would say that 98% of the boxing media, boxing experts and fight fans, picked Errol Spence to win the fight. Last week I made some calls and was checking around a bit, and it seems now we are getting close to a 50-50 fight. This is evident as well in how the odds have changed and dropped in Las Vegas. It’s pretty simple. This is the fight to see. How often do we see two undefeated world champions, two world champions in their prime, two world champions universally recognized among the top five pound-for-pound fighters in the world? In almost 20 years promoting the biggest events, I do not remember a single one event which delivered an undefeated in their prime and top five pound-for-pound fighter. It’s a fascinating match up. And that’s why I think, as I mentioned before, with all the support from FOX and the excitement building, we will have an unbelievable pay-per-view come March 16. Both of these young men are an asset to our sport. They are great ambassadors for boxing, and all of us involved in the sport of boxing, can be proud that we as an extension of it, are involved in a sport which has two such amazing young men. Errol Spence is clearly the man at 147 pounds. He’s undefeated. He’s the king of his division, and he is today without any question, pound for pound, one of the best fighters in the world. It’s an honor to introduce now the undefeated IBF world champion, Errol Spence Jr. Errol? Hi. How is it going? Happy to be on this conference call. It’s been a great training camp and I’ve been 100% focused and hungry and can’t wait to put on a great show March 16. 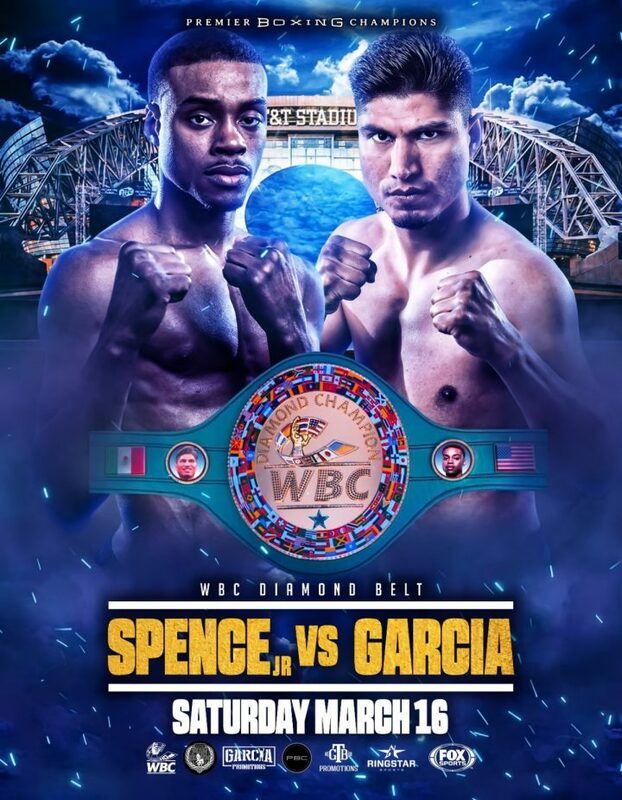 Errol, I am curious if you have noted, like Richard Schaefer said, that more and more pundits are seeing that it’s possible that Garcia beats you. Have you noted that? Have you heard people, more people saying, no, I give Mikey a good chance to beat Errol? And if yes, why do you suppose that is? That’s not something I pay attention to, it’s tight enough from what I’ve seen. I can’t worry about that. I’ll just worry about what my camp thinks and how our preparation is going and my focus is 100%. I’m just ready to put on a great show. So I don’t care if that changed in his favor for all I care. It just means he’s going to get in the ring and fight. You’re up in DeSoto, right, not actually Dallas? Yes, but I grew up in Cedar Hill, DeSoto, and I grew up in Dallas. So I went first kindergarten all the way to fourth grade in Dallas, and then I went to Cedar Hill and then I went to DeSoto for ninth grade all the way to 12th. You said you went to two high schools. Could you list those two high schools for me? Cedar Hill High School and DeSoto High School. I know when you and Derrick first met, I know you guys talked about how you kind of were in the ring against each other. Do you remember the name of that gym and the city where located? Vivero Boxing Gym. It’s the same gym that Vergil Ortiz started at too. You and Derrick often talk about your big sparring partners, sparring middleweight, sparring heavyweight, things like that, just wondering if you guys took a different approach to this fight, if you aimed for smaller, faster sparring partners, and if there are any you can name specifically? We have added some lighter spars, 140 pounders and guys that fight at my weight. One of them is Amon Rashidi, and he’s fighting out on the undercard and he’s 5-0. He’s pretty much the same height as Mikey Garcia. But we’ve been still adding in bigger guys, just for the physical approach and just getting good work out of those guys. When Mikey first started talking about fighting you, what was your inclination about wanting to fight him? At first I didn’t really care too much for fighting him, it got to a point where he started talking a lot more and a lot of other welterweights. I was pretty much busy, like Shawn Porter, like Keith Thurman and Danny Garcia, they all had their dates. Manny Pacquiao too. They were the obvious options for me. Then when I found that I could be fighting at AT&T Stadium, then it just made sense. If this fight wasn’t proposed to be at AT&T Stadium, would you have taken the fight still or would you have wanted to go in a different direction? I don’t know. Everything happen for a reason. So it’s at AT&T Stadium. I don’t know what I would have decided if it wouldn’t have been at AT&T Stadium. If you do win, if you get by Mikey, that you are the best fighter in the world? Like I always say, it’s not just about winning. It’s about your performance and it’s how you win. So if I have a spectacular performance, then I do rate myself as pound-for-pound just the best fighter in the world too. Do you subscribe to the theory that has been running out there since this fight that Mikey doesn’t have a chance? He’s the little guy. You’re the bigger guy. Do you subscribe to that David and Goliath theory? Or do you feel Mikey is a great fighter, he brings more to the table than people really think? I think he definitely brings a lot to the table and I don’t – I mean people who say that he doesn’t stand a chance I feel like don’t really know anything about boxing or don’t know the history of boxing, just to say he doesn’t have a chance. He does have a title at 140. That’s just one weight up from 147. So he does have experience fighting at 140. So I mean everybody has a chance. He does have a chance. He does have a lot of skills and he is fundamentally sound. He comes from that boxing pedigree. So he definitely has a chance. Is this the biggest fight of your life? Bigger than the Kell Brook fight? It’s kind of hard to say because without that win and especially going overseas and fighting someone considered one of the best welterweight in the world and beating the man in his hometown, that added to a lot of experience in different things that have led me to this point and led me to the victory I’m going to get next Saturday. I think this is the biggest one, just where it’s at and it’s on pay-per-view and it’s been hyped up to be really big. I think this might be the biggest win of my career right now. What are some of the flaws you’ve seen in Mikey’s game between now and start of training camp? Mikey is tough and I like that. It shows that he’s really coming to fight and it’s going to be a great fight. They can feel however they feel. So I definitely have a game plan to exploit my strengths. And me and my camp, we’re working hard. My coach has been watching him and we have a game plan ourselves. In the ring we’ll find out if my reach and my size is going to be an advantage or not, or maybe I just have really good ability. So we’ll see. Fighting at AT&T Stadium, does that put any added pressure on it, or is it another day at the office for you? Well, me personally, it’s another day at the office, but it’s definitely a huge fight just exposure wise and becoming the superstar that I want to be. So I mean this is a huge fight. But for me, that’s another day in the office. I don’t really think about that till after the fight and the magnitude of it till after the fight. So I don’t get caught up in the moment but it is a huge fight, especially for my career. Do you really expect Mikey Garcia to be able to go 12 rounds with you? If he goes 12 he goes 12, but with me, my mentality is, I train hard for a hard 12 round fight, because I don’t want to not expect something and then something else happens. I always tell myself that to make sure that I’m fully prepared, not just physically but mentally for a grueling 12 round fight. So even if I do get the knockout, all through camp we’re focused on training hard for a 12 round fight. If I get the knockout, then good, but it’s something in my mind that, I want to be prepared if I have to go 12 rounds. Do you admire Mikey Garcia for wanting to step up and fight you, taking on this challenge? I respect him. I really respect Mikey Garcia and his skills and his talent. It’s apparent. But other than that, I’ll respect him after the fight depending on this whole game plan and things like that. I definitely respect him for taking the fight and now that he’s rising to the challenge, he challenged me. I don’t know who I would be fighting or where I would be fighting at if he didn’t call me out. So this is a great fight and the magnitude of the fight is great too. So I’m just grateful to have this big fight of this type of magnitude on FOX pay-per-view. So I’m happy to be at the here right now. Are you just as excited to be in this fight as we are to see this fight? I’m definitely excited. I was excited as soon as I found out where it was going to be at and basically it was just an easy fight to make. I wanted to fight, and it made sense for it to happen here. I’m excited to be fighting at home again and especially because we’re fighting at AT&T Stadium. What concerns you in your game plan about Mikey Garcia the most? Nothing really. I feel like I’ve seen every style there is to see. Especially a guy like Mikey Garcia who’s very traditional and has a good full body of work. But at the end of the day, he’s very traditional. I’m very familiar with his style and what he does, things like that. I’ll be prepared for anything that he brings to the table. Cameron Buford: Thank for answering the questions. And man, you mentioned those names before. Are those some of the names or some of the guys you would be looking at fighting after you fight Garcia next weekend? Okay. I’m just going to have Errol make some closing comments. But I just want to add something. Errol Spence is one of those throwback fighters, a fighter who we all know is going to fight anybody and everyone. Being as good as he is, being pound-for-pound one of the best, being undefeated, there are not too many other guys calling him out. So for Errol Spence Jr. to be headlining, to have his opportunity to headline his first pay-per-view event, to headline a pay-per-view event from the AT&T Stadium. He’s also headlining the first PBC on FOX Sports Pay-Per-View, the first time that a free over the air network, television network is entering the pay-per-view space, and Errol Spence is there and they’re doing it with him. And then to have the opportunity to fight an undefeated fighter, one of the best fighters in the world as well, a fellow top five pound-for-pound fighter with Mikey Garcia. You look at all of these opportunities, Errol Spence Jr. is perfectly situated to really become the face of the sport and be the face of the sport. He has the skills, he has the talent and he has an opportunity, and he knows all of that. So I can’t wait to see you next week, Errol, it’s going to be a big week, and it’s going to be an exciting week. Let’s start the journey to make history here. I’d like to turn it over to you again, Errol, to make some closing comments. I thank everybody for coming on the conference call. This is a real boxing event, a real boxing match between two great fighters, two top 10 pound-for-pound fighters who are undefeated. So that’s rare to have in today’s time, especially in boxing. So I hope everybody tunes in. You can get your tickets on SeatGeek.com. It’s going to be an amazing event. And I can’t wait to put on another amazing performance. I’m 100% ready. I’m in tip-top shape. I’ve been training hard. I’m on crazy focus and I’ve basically got tunnel vision, straight to Mikey Garcia March 16. So make sure you are tuned in. It’s going to be an amazing event. Thank you. The PBC on FOX Sports Pay-Per-View undercard begins at 9 p.m. ET/6 p.m. PT and will feature undefeated former super middleweight champion David Benavidezbattling veteran contender J’Leon Love, unbeaten former bantamweight champion Luis Nery taking on former champion McJoe Arroyo and fan-favorite Chris Arreola facing unbeaten Jean Pierre Augustin.